Sweet Home Cabarete! How and Why We Left the Boat (For Now ). This cabbage truck was piled high with more cabbage than I ever thought humanly possible to load onto a cabbage truck. PS This is a cabbage truck. This is how Viv always falls asleep in the car. In the DR, laundry is hung out to dry everywhere you look and the air is habitually detergent-scented. I love the smell of clean laundry! It's hard to tell from this photo, but Trav & Hud were chasing each other around with the stalks of giant gladiolas (flowers) that they found on the ground. This episode lasted 20 minutes and involved a lot of flower-whipping. We were in the mountains near Constanza. For non Spanish-speakers, the signs read "Strawberries and Jam" and "Exotic Garden". We pulled in to buy some strawberries and jam and the couple who owned the place invited us into their home, showed us around, and spoke to us enthusiastically in fast Spanish that we tried our best to understand. They were the definition of hospitable and gracious. When you purchase jam at Jardin Exotico, everyone has a seat in the living room and then you are offered something to drink and once you are relaxed then the commerce of strawberry products can take place. The order is placed and a few minutes later the strawberries arrive from one room and the jam from another. The whole transaction takes about 15 minuets and you learn that the owners' adult son lives in Orlando, or that his name is Orlando, depending on your level of Spanish comprehension. (And the jam was delicious). Here's Trav, fixing the wind generator in Moxie's crowded cockpit Trav has become extremely adept at fixing anything and everything on our boat. It's pretty impressive. The wind gen supplies power to our batteries, along with our solar panels. Laundry day on Moxie. Most of the time we use laundromats or pay someone on shore to do our wash, but sometimes we have to do it the old fashioned way. This was the delicates cycle. Ok people, LOOK AT MY HAIR. I haven't cut or colored it since August. Enough said. There's a HUGE, crumbling, abandoned resort in Luperon that we are all kind of obsessed with. We like sneaking in and poking around the empty unlocked rooms and dry mega-pools. It's super creepy and fascinating and sad. The kids and I tiptoed in at night. We were all too scared to go any further. This is our favorite place to eat in Luperon, it's right on the beach and a locals hang-out. Note the green moto-taxi that brought us- all 4 of us plus the dog fit in there! We love catching rides in those things. Moto Taxi!!!!!!!! We just can't get enough. In the DR, motorcycles rule the streets. I won't even get into how dangerously they drive, because that could be a blog post in and of itself. But worth mentioning are the impossibly enormous things that people carry with them on their motorcycles. Like, for example, 5 other people (seriously, the record number of people we've seen on a motorcycle is 6), OR a GIANT steel bar (weaving through traffic at top speeds, threatening to take out anyone and everyone) or this hefty cooler full of fish for sale. It defies everything you think you know about physics or engines or possibilities in general. Moog in a tunnel slide, in a place called "Fun World", outside of Cabarete. We learned something! If you want to find the BEST sea glass, go to a beach where partying occurs (beer & rum). This treasure trove was all found in Sosua, a sweet town between Puerto Plata and Cabarete. This is Hud in his first Kiteboard lesson, learning to control the kite. It didn't take long for both Hud & Trav to become TOTALLY HOOKED on kiteboarding. Pictured here with Hud & Viv is Alba, daughter of the owner of Big Willy's Kiteboarding School who instructed Trav & Hud. Alba is 4, speaks 3 languages fluently, and is our new BFF. Giant vats of oil where fish is fried outdoors at a restaurant outside of Puerto Plata. One time Travis almost burned down our kitchen in Telluride when he overheated a pan of oil while making a late night pop corn snack. Not sure how this guy does it? Looks like the key is more open flame. Once we'd decided that we wanted to live in Cabarete, we immediately began the bittersweet process of closing down Moxie for the hurricane season. This required removing and storing all 3 of her sails (among a million other tasks). This was a hefty project. Before we left Luperon, Hud, Viv and I got our teeth cleaned. The minute we arrived for our appointments, the receptionist gave Hud and Viv a piece of hard candy to snack on (not kidding). For all three of us, the cleanings cost a whopping thirty dollars. That's 10 bucks a cleaning, folks. (U.S .Dentists please get the memo: the price of having your teeth cleaned should not compromise your patients' ability to purchase the food that their teeth are designed to chew and subsequently that you will scrape). We love to buy fruit in the DR! Pineapples, watermelon, limes, mangoes, papayas, avocados, and more. Fruit stands line the highways. This was on the way to Cabarete. The condo building we moved into is full of cool metal sculpture and a has a little fish pond. Our condo. Check it. A kitchen that more than one person can fit into at a time. A full size fridge that opens from the front, not the top . Counter space. Cabinets. After 7 months of cooking on Moxie, I feel like I've died and gone to culinary heaven. "This feels right." Trusting our mutually strong, instantaneous gut reaction led us to 18 happy years of building a life and a family in a community we now enthusiastically call home. That was a leap of faith that ended up really working for us, and it taught us an important lesson: when it comes to following your instincts, no matter how quickly or spontaneously, taking the plunge is nearly always a very good idea (ie: selling all of your belongings, leaving your job and moving onto a sailboat). Well, guess what, folks? It's happened AGAIN! That insta-attraction to a place, that immediate feeling of "This feels right", it hit us like a ten foot wave the minute we stepped foot into our new love, our latest obsession...Cabarete. It was Trav's birthday and I wanted to do something special for him. 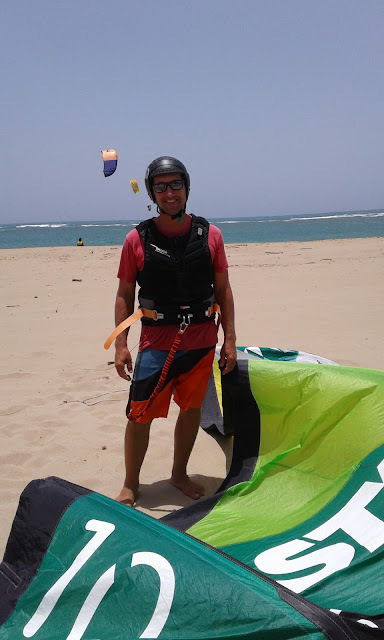 We were on Moxie in Luperon, and I knew that Cabarete was a mecca for kiteboarding, a sport Trav has always wanted to try. My plan was to treat the family to a couple of nights in a fancy hotel and to sign Trav up for a kite lesson as a surprise. The only problem was, I COULD NOT find a place that worked for us. The fancy hotel I wanted would not take a large dog like Sadie (despite my valiant attempts to sweet talk the general manager and the staged photos I sent of Sadie looking smallish and practically catatonic). Other hotels were booked, others too pricey. Finally, out of desperation I ruined the surprise and enlisted Trav's help in the hotel search. We found a condo on Air B& B that seemed ok but for the life of us, WE COULD NOT BOOK IT. Technological difficulties or red-tape details kept stopping us from finalizing the rental. We were SO frustrated! We considered scrapping the whole idea and not going. Finally, we decided just to drive there and see what happened, and in retrospect, we now know that the reason we could not book a place, was because the RIGHT place in the spot where we are now happily convinced that we are MEANT TO BE, had not presented itself to us yet. 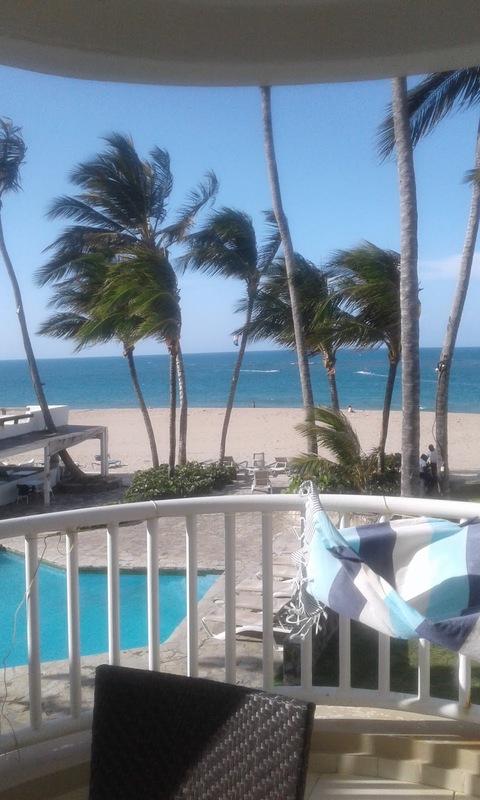 Literally, the first place we saw as we pulled into the Cabarete town limits was the Kite Beach Hotel. The rest of the story is a series of perfectly magical universal-smiling events that fell into alignment like a line of dominoes, tumbling satisfyingly and precisely, one by one. The "hotel" was really condos. They took dogs. The place was stunning and immaculate and affordable. It had a pool and a cool restaurant/bar. It was right on the beach, right in the middle of all the kiteboarding action, and the sky was swarming with kites. It was adjacent to the best kite school ever, which just happened to have availability right that very minute. We checked in at 3:30 and Hud & Trav began their first kite lesson at 4 pm. While they kited, Viv and I relaxed on the beautiful beach, and she instantly made a friend. Post lesson, Trav and Hud were wearing the biggest smiles I'd ever seen on them - they were now officially kite junkies. Trav and I had a mojito at the bar, we all went to dinner, and by 7 pm we had decided to move to Cabarete to wait out the hurricane season. Easy as that. The next morning, we got lost while driving through town. We turned around on a side street and found ourselves stopped beside a rental agency. In the time it took us to read the sign on their door, a sweet lady named Maria had come out of the office to greet us. She thought we might need directions. We asked if she had any dog-friendly condos for long-term rent on Kite Beach. She said yes, but she only had one. We made plans to see it the next day, and weirdly, it happened to be the unit directly above the one where we were currently staying! The condo for rent had the same view we had fallen in love with, and was overlooking the pool our kids had fallen in love with playing in. The price was right (a screaming deal! We haven't paid this little in rent since our pre- Telluride days! Plus the place is a monstrous 2 bedroom with high ceilings and a giant deck) and we immediately booked the place through the end of October. In November, once the hurricane season has passed, we will return to the boat and start sailing again. Once we put the deposit down on the condo we literally RACED back to Luperon and closed up Moxie as fast as we possibly could. The process took us three days, sweating in the oppressive heat of the windless harbor. We rented a car on a month-to-month basis. We hired someone to watch Moxie, to open her up periodically and air her out, and to keep her bottom clean. (And she's only 1.5 hrs away so we'll be checking on her now and then as well). Giggling, laughing, relating, and inspired the whole way through this post!! I am so happy for you and now maybe it will give Tuck, Mango and I a chance to catch up to you! xoxoxo!! Thank you Catherine! And YES I hope we meet up, how fun would that be !?!! What an adventure. Your family is inspirational. I smile all the way through every post. I can't wait to hear how it is living there. Omg! I love you guys so much!!!! Thanks Dodi. I've found that once you get into the habit of doing, it gets easier to keep it up. Booties helped me realize that, actually, so thank you! And by the way, you sound like you have a sailing hankering in a big way. I think you guys should think about doing this. If not sailing, traveling as a family. I can see your gang really loving (and thriving in) this kind of experience. Enjoy getting your land legs back! Hola! It's Tracy. I live in your building now. Cute blog ;) See you on the beach. Stasia, Amazing! I'm so excited for your NP trip!!! Back in the late 90s, Trav and I lived in Seattle and took many cross country drives. We hit as many national parks & monuments as we could, sometimes driving hours out of our way to see a little one, and taking specific trips to see the big ones like Yosemite. We had a NP book and would check off the ones we'd been to in different colored markers (red for Trav, blue for me, green for ones we'd both been to:)). You are going to have the BEST time and your kids will learn SO much! And I agree about putting something on the calendar- I always used to say when we wanted to plan a trip (and back when we owed a calendar), "Let's put it on the calendar like it's our JOB!" You always, always inspire me. I always look forward to your posts. You put so much good into the world.Thank you. Hey, love the pictures. You all look so healthy and beautiful! Very interesting blog as usual -- can be a book in the future! Love you all very much! Hi Mom! Thanks for your sweet comment. It's amazing how much the kids talk about you and Dad as we travel- they want to be sharing the things we see with you. They really became so much closer to you both when we spent all that time in ME last summer/fall. they miss being in your house-- so do I! Can't wait to see you soon for more fun and shenanigans (and sushi, says Viv :)). Love you so much, Mom! Love the blog. Now give thought to a catamaran, Big saloon without stumbling over each other,and don't forget sailing level... But keep up the fun, we are out here watching..
Hi Jen & Trav. I would like to keep in contact with you. I hope to return to DR in fall. I will give Putula's my contact info, or maybe we can message? Jan Marie. Hi Jamboree! yes, let's keep in touch! moxiesv@gmail.com is the best way. Hope to see you in the DR! Jen, I have finally managed to remember to check into your adventure page! Sounds so wonderful so far. The timing is good for your advice, I am thinking of buying a nursery and expanding/changing my business. But for us, finances is the limiting factor. Otherwise, we would definitely quit our jobs and travel, too! We spent three weeks in Cuba, had an amazing time, and are looking for more places to go. Maybe the DR?! :) xoxoxo Abigail sends big hugs to Viv!